California Skateparks has released the site plan for the upcoming Maloof Money Cup Contest in Orange County. The design is broken up into four sections and as with previous Maloof designs, it pays homage to local spots. 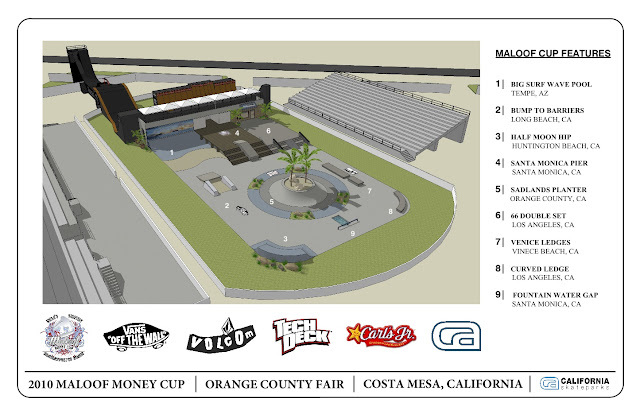 Lane 1 includes the Big Surf Wave Pool, a bump-to-barrier over sand gap, and the half moon quarter pipe. Lane 2 includes the “66″ double set, the Venice ledges and the curved ledge. Lane 3 is the Santa Monica Pier triple set with 2 rails and a manual pad/hubba ledge. Lane 4 (Tech Dech Best Trick) is the Sad Lands Planter. It’s definitely a beachy vibe into the design for the OC event this year. The design was led by Geoff Rowley, Lead Designer, Colby Carter with the help of Owner/Designer Joe Ciaglia.